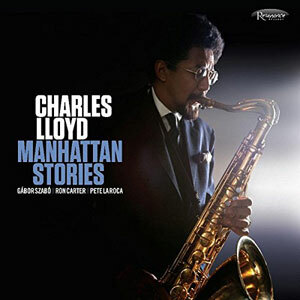 With all the noise being made about the latest unearthing of the John Coltrane recording from Temple University, Offering, it is easy to let this Charles Lloyd double CD, Manhattan Stories pass like a ship in the night. But better beware, that might not be a very good idea. The Resonance Records team of George Klabin and Zev Feldman have combined forces with Charles Lloyd’s wife, Dorothy Darr to produce a significant recording. George Klabin pulled another rabbit out of his proverbial hat with this one from his vault of classics and Dorothy Darr and Mr. Lloyd matched that Judson Hall gem with one of their own—a recording from the legendary Slugs’ Saloon—both appearances in NYC. And once again both masters have been exquisitely restored, mixed and edited by the indestructible team of George Klabin and Fran Gala. This rare package must take its place as one of the finest sets in the Charles Lloyd book as well as one of the finest exhibitions of tenor saxophone playing of any era. Add to that the inspired pairing in 1965, of Mr. Lloyd and guitarist Gábor Szabó, the second voice that shadows the master tenor man like a musical hound intoxicated by the spoor of a great saxophone performance. And then there is the classic rhythm section of a young Ron Carter on bass, with Pete La Roca Sims on drums that seems to cut loose given the slightest opportunity by the leader on these sets. Charles Lloyd was one of those players who came in the wake of two great masters of the tenor saxophone—John Coltrane and Sonny Rollins. His roar was melded with a silken tone and this sets him apart from the two elder statesmen; in fact his playing was, if anything, informed by the smoother edges of Lester Young’s monumental tone. Mr. Lloyd’s sensibility was influenced also by the angularity of Thelonious Monk’s and he was a singular voice of his generation. Whether playing tenor saxophone or flute Mr. Lloyd languid, but never driven by tempi brings fresh light to his reading of classic charts reinvented on his own terms and in his own vast playbook. He relishes the opportunity to make oblique and quicksilver references to tradition which have established his unique brilliance as a “student” of the history of jazz combined with a certain affection and mastery of early 20th Century master Béla Bartók, who seems to have pointed Mr. Lloyd in the direction of “comparative musicology,” something that was surely responsible for leading him to late incorporation of Indian classical and folk forms into his music. This seems to have already been a characteristic of his playing on this double CD, Manhattan Stories. While his playing is in all registers and not limited to, say, the upper register of the tenor saxophone, his virtuoso performances echo the high-flying approach to the Indian “shenai” with a dexterity as immaculate as it is awe-inspiring, as the songs here are taken at a speed of ideation that less gifted saxophonists can only envy. 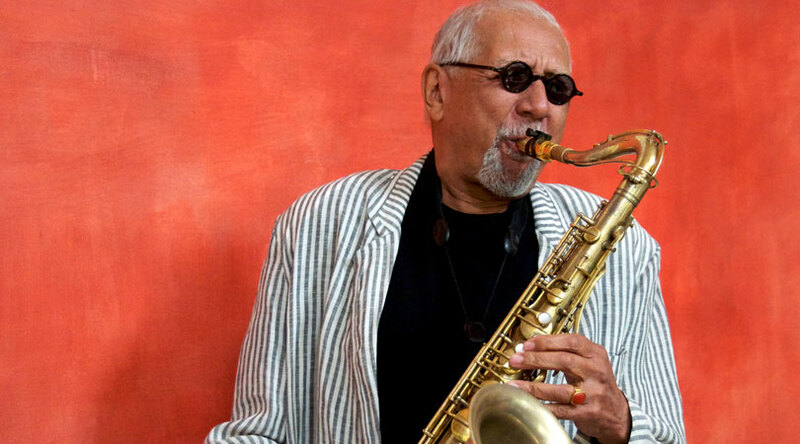 Charles Lloyd mirrors John Coltrane and Sonny Rollins love for the saxophone in the programme of CD 1. At the beginning of “Sweet Georgia Bright” the reverberation of New York’s Judson Hall in this live recording adds warmth to the texture of Mr. Lloyd’s anthemic chart making ample room for Ron Carter’s rolling bass-line and Pete La Roca Sims’ cymbal splashes—which played with hard sticks—cut through the solo of Gábor Szabó’s impressive solo. Mr. Lloyd follows soon after, finding time to draw out a sense of longing from the ululating notes of the tenor saxophone, flanking dotted rhythms as they are in the performances of Ron Carter and Pete La Roca Sims, where Mr. Lloyd shortens the note values as Gábor Szabó joins in to do the same. On the ballad, “How Can I Tell You” the purist in Mr. Lloyd comes to the fore as he deals the melody a glancing blow before he launches into his elegant solo. Here Mr. Lloyd also shows that he is in the forefront of interpretation of the classic ballad form. But he has also been ploughing his own furrow and this disc offers an example of his current thoughts that nonetheless incorporate swift minuet-like motifs in the svelte use of his tenor saxophone. The set closes with the conspiratorial partnership of guitar and flute on “Lady Gabor,” which begins with flute improvising on a guitar vamp over an ostinato bass line that suddenly falls silent after the introduction of drums, signaling the beginning of a terrific resurgence of the vamp before Gábor Szabó introduces his long meditation. This is a brilliant portrait in unwritten shadings in colour and meaning of the slow movement of the chart, the fugal finale of which is mightily imposing. Although Zev Feldman’s notes provide the mundane reason for the second CD, it was an inspired idea nonetheless, to include this more intimate performance at the brilliantly notorious Slugs’ Saloon, also in NYC that inhabit respectively “Lady Gabor” and that other seminal composition of Charles Lloyd, “Dream Weaver.” The set somehow lends itself to the epic “Slugs’ Blues” an epic tribute to the saloon that had become a vantage point for some of the finest musicians in New York or those passing through, and who rubbed shoulders with the quick-witted and the pimps and peddlers of the streets of NYC. But while the setting is street-level, the music is celestial, beginning with this cantering and visceral blues. It would seem that the audience is spellbound for most of the time, occasionally whooping it up when the soloists hit a particularly brilliant and twisted set of notes or a mighty melisma. This beautifully ominous take on the blues is fuelled by four of the finest soli. Beginning with Mr. Lloyds’s majestic one, followed by Mr. Szabó’s sliding brilliance, then Ron Carter’s monumental melodic stretch which Mr. Lloyd brings to a conclusion introducing the staccato smash and scatteration of Pete La Rocca Sims’ rumbling solo. “Lady Gabor” features minute yet telling variances from the other version on this package. There are quick-witted exchanges between ensemble and soloists here, especially Mr. Lloyd’s flute and the initial rolling thunder of bass and drums. Finally there is the full-bodied, richly expressed “Dream Weaver”. This latter work is played in an oriental-inflected mode and is heard as a feature against the vampish backdrop of guitar, bass and drums played with undoubted harmonic richness and transparency. It is a striking and thought-provoking piece and it is unerring as the music evolves towards its plangent culmination.